I am going to assume you have a basic idea of what metadata is. For our purposes, we can borrow from wikipedia and define it as “the information used to search and locate an object such as title, author, subjects, keywords, publisher.” Although we typically associate metadata with the digital online world, metadata actually predates computers and the Internet. Do you remember all that information on the little 3X5 cards in the library’s card catalog? That was metadata. 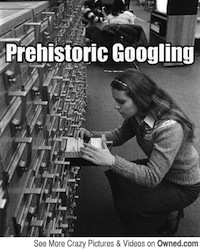 If you don’t remember card catalogues, 1.) go ask your parents, and 2.) stop making us feel old. In ye olden days, that information helped us find the books we were looking for in the library, after we’d walked five miles in the snow, uphill both ways, to get there. Today, metadata is even more crucial for finding books. For authors that means metadata is critical to BUYERS finding your books online. Metadata is part of what search engines, such as those at Google or Amazon, use to locate results; crucially, it is the part that publishers can control. During a workshop at the recent Romance Writers of America meeting in Atlanta, I was reminded of the importance of metadata to a book’s success by a story told by literary agent Kristin Nelson. One of her authors had a three book series that was doing ok on Amazon, but not as good as they had expected. Even more strangely, the second book in the series was selling more copies than the first book in the series. When she investigated, she discovered that the second book had more tags and that the books within the series did not have matching tags. This series had been traditionally published. So, she and the author did not have the ability to change the tags themselves. They had to convince the publisher to fix them – and that apparently took quite some time, even with the agent providing the publisher with the exact tags they needed to put on Amazon. Once the tags had been fixed, the series jumped 200+ spots to #1, 2 and 3 on the relevant bestseller list. The importance of metadata in selling more books is hopefully something you are already familiar with if you self-publish. If you publish traditionally, then the story related by Nelson should convey to you the importance of not only metadata but also staying on top of what your publisher is (or is not) doing with your book. Second, the numbers on metadata are pretty staggering once you examine them. If a publisher puts out 2,500 books a year, and each of the has 10 different files of metadata (one for each of the different online retailers), that’s 25,000 different profiles that have to be updated. And the numbers only grow when you consider they would need to do it for each book they have for sale, not just the ones published in a particular year. I seem to remember her characterizing the reluctance as a “if we do it for you, we’ll have to do it for everyone” attitude, but I don’t want to quote her. It is not my goal to make this post your one stop source for metadata advice. It’s not something I’m an expert in, but I would feel remiss if I did not pass on some of the advice I heard at RWA and came across online. The gist of that is the importance of selecting keywords. Instead of going with what you think, actually take the time to research what actually gets searched by real users. You can, for example, search the frequency of Google searches for particular words and phrases here. Unfortunately, it looks like Google is phasing that tool out very soon. Those wanting to search frequencies in the future will need to create an Adwords account and use the new Keyword Planner tool. With Amazon, it is a more trial and error approach. You type in words in the appropriate search box (e.g. in the Kindle Store) and see what comes up. For both Google and Amazon, the auto-complete feature of their search boxes can provide you with useful information about the frequency of certain words or phrases. So, how does law come into this? For that, we need to know a little bit about trademarks. A trademark is an identifier of the source of goods or services – in other words, a trademark tells the consumer who made something. An example would be Coca-Cola. A trademark can be infringed in one of two ways: by causing confusion or by causing dilution. Dilution, at least under federal law, only applies if the trademark is famous. Confusion is by far the more common theory used to find infringement. Trademark infringement can result in civil liability (and even criminal liability in cases of counterfeiting) and the granting of injunctive relief. In a confusion analysis, a court asks whether the use of a similar trademark by the alleged infringer is likely to confuse a consumer as to the source of the goods. If I made my own soda and then put Coca-Cola or Cola-Coca on the label, white cursive script on a red background, then a court would probably conclude that a consumer might be confused as to the source of my cola. In other words, the court would probably say that someone would think my cola was actually made (or authorized) by the real Coca-Cola. That would mean I had infringed Coca-Cola’s trademark among other things. The analysis is a little more developed than that, a list of factors to be considered, etc., but it is more than you need to know the purposes of this post. How does this relate to metadata? In the middle of the last decade, many search engines relied on metadata hidden in the code of websites in order to find relevant links for searchers. This in turn led many websites to put other companies’ trademarks into their own metadata. This practice resulted in web searches for specific trademarks returning not only the trademark holder’s site, but also competitors’ sites that had buried the trademark in their metadata. And that led to trademark lawsuits. These cases turned on two complicated legal issues: 1.) whether putting the trademark into metadata unseen by the consumer was a “use in commerce” for the purpose of the trademark infringement analysis and 2.) whether initial interest confusion could serve as a basis for liability. Don’t worry about those details. Before the law could become settled, everyone moved from that type of metadata. Search engines moved away from relying on it because it was too easy to abuse and thus not all that useful. Once search engines stopped caring, we stopped seeing the litigation. That means that we never really got a clear answer on whether the use of a trademark in unseen metadata infringed the rights in that trademark. Instead, the litigation moved on to what could be gamed – purchased adwords. Since the late 2000’s to the present, we’ve seen a number of cases raising the same complicated issues in the context of adwords sold by search engines, primarily Google. The doctrine is still unsettled. Regardless of that uncertainty, or even the probability that results are trending strongly away from liability, the key for you, the indie publisher in control of their own Amazon metadata, is that lawsuits get litigated! Remember how much we want to avoid that, regardless of the end result. With this list in mind, you can see why I hate the 1-800 Contacts v. Lens.com lawsuit. 1-800 Contact has spent enormous amounts on legal fees—at least $650k as of 2010–pursuing Lens.com for competitive keyword ads that had generated $20 in profit for Lens.com (no, that’s not a typo) and, at maximum, a few tens of thousands of dollars in revenue for Lens.com affiliates. After 6 years in court, the case isn’t over yet. This week, the Tenth Circuit affirmed most of the district court’s opinion and emphatically rejected most of 1-800 Contacts’ lawsuit against Lens.com for the competitive keyword advertising it and its affiliates did. However, a small issue got remanded for a jury trial, so the parties will get the pleasure of wasting many tens of thousands of dollars more to conduct the jury trial unless they can finally find a way to settle. The seeming irrationality of trademark owners pursuit of these types of claims is probably a result of the accepted wisdom that failure to protect trademark rights can result in losing them, but the reason for the litigiousness is irrelevant for our purposes. What is important is that the risk of getting sued is probably greater than we would like. What does this mean in its simplest terms – think twice about using metadata that is someone else’s trademark or that could cause confusion, and then don’t do it. Note also that this sort of misuse of metadata is something that the relevant intermediaries – e.g. Amazon – frown upon. Amazon’s Metadata Guidelines specifically prohibit the mention of another’s trademark or the unauthorized use of another author’s name or book title. That means even if no one chooses to sue you, Amazon could pull your book. Remember the modified second question for self publishers. Take away: Metadata is critically important, but don’t try to get cute and game the system with someone else’s trademark, name, or title. Raverinlaw failed to get off the ground when I could not find a glow stick-based wordpress theme. No, I’m not talking about ecstasy. This isn’t Raver-in-Law. When I say “can I do X,” X refers some action by an author that might lead to legal problems. For example, it might be “can I include song lyrics in my novel?” or “can I use another author’s character in my story?” or “can I write a story about a sentient Barbie doll?” or “can I use a celebrity as a character in my novella?”. Question #1: Will a court rule against me for doing X? Question #2: Will a gatekeeper react negatively to my doing X? Question #3: Will I get sued for doing X? So, let me explain why you want to consider each of these three anytime you ask a “Can I?” question. I will assume you are in the world of traditional publishing. At the end, I’ll briefly go into the differences in the self-publishing context. At its core, this question asks about how the law judges X. Is X copyright infringement? Is X an infringement of a celebrity’s right of publicity? Is X trademark infringement? Another way to rephrase the question is will I win or lose a lawsuit about X. My impression is that this is what most writers have in mind when they ask a “Can I?” question. Although the answer to this question influences the answer to the other two questions, it may ultimately be the least important of the three questions in a writer’s decision-making process. It is also my impression that this is what most lawyers, particularly newer lawyers, think when they hear a “Can I?” question. It’s certainly where my mind goes first. You see, this is what lawyers are trained to do – i.e., turn facts into legal conclusions. Answering question #1 is a lawyer’s core competency, and therefore it is the realm in which they feel most comfortable. It’s not the only competency a lawyer can offer. An experienced lawyer should also be able to offer you guidance on question #3, and more experienced lawyers will offer counsel on question #3 without your prompting. Question #2: Will a gatekeeper (e.g. an editor) react negatively to my doing X? If your goal is to get published in a magazine or by a traditional book publisher, then you will have to get past at least one gatekeeper. This gives the “Can I?” question a new dimension, namely question #2. If an editor thinks your doing X creates too great a risk of incurring liability or of merely getting sued or of creating resistance within their own company, then your having done X may lead them to reject your story or novel. Regardless of its other wonderful qualities. This is what Writer-in-Law thinks fantasy editors look like. The answer to question #1 might be that you would win any resulting lawsuit, but the answer to question #2 might still be negative in terms of your getting past the gatekeeper and reaching your goal of getting your story or novel published. In fact, since the answer to question #1 is rarely if ever given in absolutes (“You would win”) and is more commonly given in probabilities (“You would likely win”), you can see how a gatekeeper might be unwilling to take the risk. 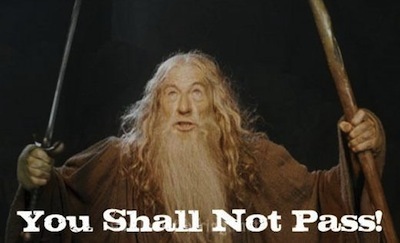 Further, most gatekeepers are unlikely to seek out legal advice while considering your manuscript. So their impression of the risk or even their not wanting to have to go through the trouble of getting legal advice may lead to a rejection of your manuscript – a rejection not based on its overall quality but simply on your having done X. Of the three questions, question #2 is also the least likely to be answered by a lawyer. It is not really within their area of expertise unless they have a lot of experience in the publishing industry (precious few lawyers do, even among those who specialize in intellectual property law). You really have to get answers to this question either by talking to people with experience in the industry or by examining what has gotten past gatekeepers. As I pointed out in an earlier post about the Midnight in Paris case, whether you win a case or not is not the only consideration. Defending a lawsuit can cost you a lot of money, and if you are in the US, you have to pay your own costs and attorneys even if you successfully defend your work. Your total outlay can get into six figures just to get you through a trial. It will also cost you time across multiple years. It can keep your work in legal limbo for years. And that does not even factor in the psychic drain caused by years of fighting and uncertainty. So the question “Will doing X get me sued?” may be just as important as “Will a court rule against me?”. Of course, the likelihood of winning a lawsuit theoretically influences the risk of being sued. Theoretically. 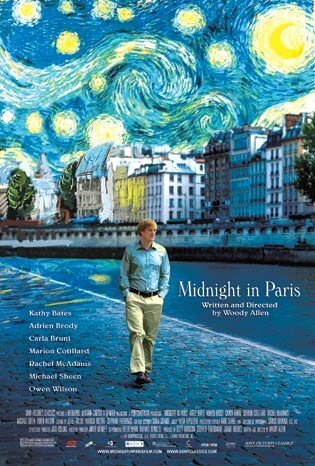 Again, remember the Midnight in Paris case. No one though that was a winner, but the Faulkner estate still sued and Sony still had to defend themselves. There is no question that some rights owners will pursue anyone who comes even close to their rights. Many of them have such extensive resources and the willingness to use them that most smaller entities just stay away from their rights even where the law would likely allow a particular use. In other words, even if you are legally in the right, do you want to expend the money and energy defending your “doing X”? I submit to you that the answer is most often going to be no. The only exception I can think of is where the entire expression, what you are trying to say, depends on the use likely to anger a rights holder. The Wind Done Gone is an example. They had to be fairly certain that Margaret Mitchell’s estate would sue, but went ahead with publication anyway. Experienced lawyers should be able to advise you on many entities who are known for vigorously defending their rights, even when the use in question is likely within the letter and spirit of the law. However, they can’t predict what every rights holder will do. Again, observing what is already out there and whether a rights holder has sued in the past can give you some, but not complete, guidance. The questions and my discussion on them has so far assumed traditional publishing. How do they change for self-publishing? The primary difference is that the gatekeepers disappear. You don’t need to get past an editor worried about your “having done X.” However, that doesn’t mean question #2 goes away, because you still have an intermediary who is in control of the availability of your work. Amazon or some other online retailer can still pull your book or website when a rights holder complains to them (through a notice and takedown procedure or a threat of suit against the retailer). Do you think Amazon has a big interest in fighting for you? Nothing against Amazon or any other retailer, but it’s not really their fight. Recall what happened with the recent ‘Spots the Space Marine‘ kerfuffle. 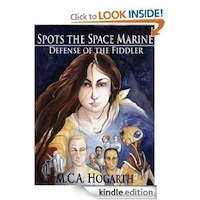 Games Workshop did not sue the author; they got Amazon to pull the book. Now, eventually Amazon put it back up, but only after a fairly big rights advocate (EFF) entered the fray on the side of the author. So question #2 becomes: Will an intermediary pull my work because someone complained about my doing X? The other difference with self-publishing is that you miss out on some of the protection the gatekeepers provide. Their reluctance to push boundaries may be a negative in your attempt to get your work traditionally published, but it also protects you from unwittingly getting yourself into trouble. Take away: When asking “Can I do X?” your most important consideration may not be whether you would win in court. It will probably be whether you want to fight gatekeepers, intermediaries and litigious rights holders – or whether you want to spend your time and energy writing. 1. Given enough time, any object which can generate musical notes will be used to play the Super Mario Brothers theme on YouTube. 8. When a company or industry is facing changes to its business due to technology, it will argue against the need for change based on the moral importance of its work, rather than trying to understand the social underpinnings. Taking a bit longer to consider both, I’m not sure either is directly applicable. I’m not sure Patterson’s concern is valid, and I’m suspect that some of the emotion in the above referenced responses stem from concerns about being able to make a living and to have a feeling of worth about what one does. But I do continue to wonder whether rule #8 can be either descriptive of some what is going on in publishing or perhaps even helpful in thinking about the future of publishing. From the Internet to the iPod, technologies are transforming our society and empowering us as speakers, citizens, creators, and consumers. When our freedoms in the networked world come under attack, the Electronic Frontier Foundation (EFF) is the first line of defense. EFF broke new ground when it was founded in 1990—well before the Internet was on most people’s radar—and continues to confront cutting-edge issues defending free speech, privacy, innovation, and consumer rights today. From the beginning, EFF has championed the public interest in every critical battle affecting digital rights. Shambling along the mobbed exhibition hall floor at San Diego Comic-Con, I spotted a familiar t-shirt at a booth. Wearing it was Patrick Race, an Alaskan computer-science major who founded the web-comic and short-film outfit,Alaska Robotics. What struck me, like Thor’s hammer to the noggin, was that while so many Comic-Con fans spend hours crafting intricate superhero costumes or picking out witty T-shirts riffing on entertainment franchises, Patrick was proclaiming his passion for digital civil liberties and supporting the organization that fights to protect them. Faulkner Quote in Movie is Fair Use, But . . .
Owen Wilson in a movie without Ben Stiller??? The ruling (which you can read here) concluded that (1) the quote met the standard for fair use and (2) the quote did not create confusion as to any affiliation between the Faulkner estate and the movie. From a legal point of view, the most interesting aspect of the opinion is that the judge collapsed two arguments related to the question of whether the use infringed ((1) the substantial similarity of the movie and the novel and (2) the de minimis nature of the use) into the fair use analysis. It’s odd since fair use is an affirmative defense that only needs to be addressed if infringement is first shown. Here the judge skipped infringement main course and went straight to the fair use dessert. But that is not why I’m posting it for you. I’m posting it to make an entirely different point. But hopefully, I would have said more and you would have carried your decisions making process further than that. Here’s the rub. Even though it appears to be a clear winner in court – you might STILL HAVE TO GO TO COURT. Notice that someone was sued. Lawyers were involved. We got an actual written decision. All of that costs time and money. This case was decided on a 12(b)(6) motion to dismiss – which is very early in the civil process. Even so, getting that far would easily cost you a sum well into five figures. The take-away is that whether something will make you liable is not always the most important question; often, the most important question is whether something will get you sued. A friend shared an article from Open Culture about a shirtless Mark Twain, complete with a bonus link to a gallery of a shirtless Hemingway. Aside from providing these for your viewing pleasure (? ), I’ll just point out a few things from the article itself. 1. Note how the article discusses how consciously Twain constructed his public image. Given current technology and current technological practices, that seems both easier and harder for writers today. It is easier in that a writer can reach the public directly with minimal effort. It is harder in that a writer’s every comment (whether thought through or not) has the possibility of being passed around (think viral kerfuffle). 2. Also note that Twain’s public image of the white suit came from a photograph taken when he was testifying before a Congressional committee about copyright in 1906. This would have been a very important time. The then applicable copyright statute was over one hundred years old and in the process of being rewritten. * Three years later, we got the Copyright Act of 1909, which governed until the the Copyright Act of 1976 became effective on January 1, 1978. The multi-year process for passing the act should not be a surprise. The 1976 act was under discussion for more than a decade before finally passing. The influence that prominent writers can bring to bear should not be surprising either. Testimony of authors and artists before Congressional committees is not uncommon. 3. I refuse to be dragged into a discussion of whether New York Times Bestselling author Kevin J. Anderson removed his shirt on a panel at DragonCon last year. * Major revisions were enacted in 1831 and 1870. Each year between the 1790 Act and the end of Nineteenth Century, an average of two copyright bills were introduced in Congress.